So far, we’ve looked at the benefits of reading to our toddlers, and we’ve talked about how to maximize each and every story time. Today I’d like to share some of my favorite books to read with children from birth through preschool. These are books I appreciate both as a mother and as a Speech-Language Pathologist. These books have proven themselves worthy, both in my home and in the clinic setting, and are great for promoting and eliciting language development. Although I am indifferent to the Spot series as a whole, the lift-the-flaps board book version of Where’s Spot? would be first on my list of books for the under-one set, and fun for little ones older than a year, too! Repetitive sentence structure, basic and familiar vocabulary, simple images, and the excitement of discovering what is hiding beneath the flaps… what more could a 6-12 month old want in a book?! absolute must-have for eliciting pre-speech sounds and early speech! with several children, using this book. Love it! This recommendation probably needs no explanation. It has withstood the test of time, continuing to be a childhood favorite for generations, despite its otherwise-out-of-date look. Goodnight Moon offers a relaxing rhythm, rhymed phrases, a repetitive structure, and familiar vocabulary, not to mention the almost-real moonlight glow that captivates little ones. Who doesn’t have fond memories of this book? Mr. Brown Can Moo! Can You? by Dr. Seuss This is another book that, in my work, has elicited first speech attempts from several previously non-verbal children. There is something about imitating animal sounds that kids just can’t resist. Love it! Hand, Hand, Fingers, Thumb, by Al Perkins Get out a toy drum and be amazed as even non-verbal and pre-verbal children join in “drum-reading” this book! Think they’re not interested? Start out doing the drumming yourself, and you’re sure to pique some curiosity. And finally, Bears in the Night, by Stan & Jan Berenstain If you want to introduce or bolster exposure to prepositions (“in, to, at, out” etc), this is your book. Of course, children won’t know you’re teaching them something. They’ll just be entranced by the suspense of the bears’ nighttime escapade. So there you have it, Moms: seven of my most favorite books to read with children under 3. But the party’s not over yet! Want some FUN ACTIVITIES to extend your reading sessions? 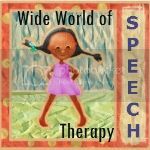 Then head over to my therapy blog, Wide World of Speech Therapy, where I’ll be sharing some kid-approved, pre-literacy extension activities from my therapy store. You’ll have the chance to buy the activity packet at a DISCOUNT this week… or just check out my ideas and let them inspire your own creativity in story times. And that concludes this 3-part series on The Importance of Reading to your Toddler. Thanks for coming on this journey into early literacy with me, Moms! I’ve had a fun time with this series, and I hope you have, too. All my best in your family reading endeavors! Disclaimer: this posts contains affiliate links. Please be assured that I only suggest products I believe will be helpful to my readers.